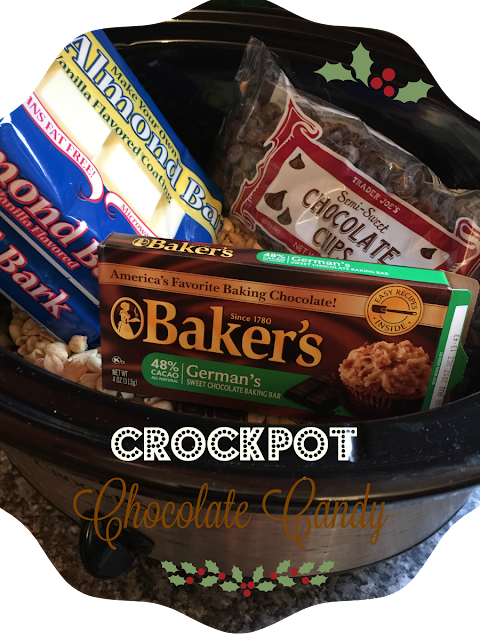 When I saw this recipe on my friend Kitty's blog Kitty's Kozy Kitchen last year, I saved the recipe in my Christmas 2015 file. Good thing I have a folder or else I would have forgotten all about it. The recipe is from Home Cooking with Trisha Yearwood, and it makes a nice gift for neighbors and friends. This candy is addictive! I packaged it in holiday bags that I found at Walmart, and used my foodie gift tags from Crate and Barrel. Here's the recipe for Crockpot Chocolate Candy. You could make it in time for Christmas. It's that easy! and cook for 3 hours. Do not stir the mixture. the candy into cupcake pan liners using about 2 tablespoons per liner. Allow the candy to cool completely before removing the cupcake liners. Kitty said she just drops the candy onto waxed paper so I did half that way. Joe liked the presentation in the cupcake liners best. I am joining Rattlebridge Farm for Foodie Friday. Thanks for stopping by! WE love Christmas CDS also:) Dan Duggan is new to me..will investigate...Fun recipe Debbie! Dan Dugan is a local musician and he plays the hammered dulcimer, guitar, piano and fiddle. Different from my other Christmas music and I enjoy that. This sounds delicious and so easy. Did you make it with or without the cranberries? I am going to try this...will let you know the results. Merry Christmas to you and Joe! I made half with the cranberries and half without. Loved it both ways. Merry Christmas to you and Howard! The candy looks wonderful, my friend! I gave some away to my neighbors, also, and it's such a easy, but delicious treat. I do love them in the liners, but last year I used the tiny candy liners and it was too difficult to put the chocolate in. Thank you for the shout out and I'm so happy that you loved the recipe. One of my favorite things during Christmas, is listening to carols. It's so soothing and makes baking and cooking extra enjoyable. Merry Christmas blessings to you and Joe! Looks tasty - I make a similar candy in the microwave - YUM!! What a fun recipe, Debbie, and it sounds dangerous to have around :) I'll bet it tastes delicious with the peanuts and cranberries, both of which I'd love. Merry, Merry Christmas to you and Joe!